When Louis XIV died in 1715, his great-grandson and heir Louis XV was five years old. The child king’s regent was Philippe II, duc d’Orléans, related to the royal Bourbon dynasty. Philippe II, in the period of French history often called “the Regency,” became known for a sensational lifestyle. The duke, famous for his sensual appetite, resigned his regency in 1723 largely because of the adverse publicity brought about by his lifestyle that was in effect funded by the French people. He died later that year. Philippe II’s downfall was followed by that of the financial network set up in France by the Scottish economist John Law. Philippe II had employed Law to help the French economy, which had suffered severely from the almost incessant wars of Louis XIV. Law’s note-issuing bank was a spectacular success, until it collapsed after a bank run in 1720, plunging France and Europe into a severe economic crisis that contributed to the French Revolution. John Law was exiled from France. Had Louis XV followed a more conservative fiscal policy, the revolution might have been delayed, or averted. 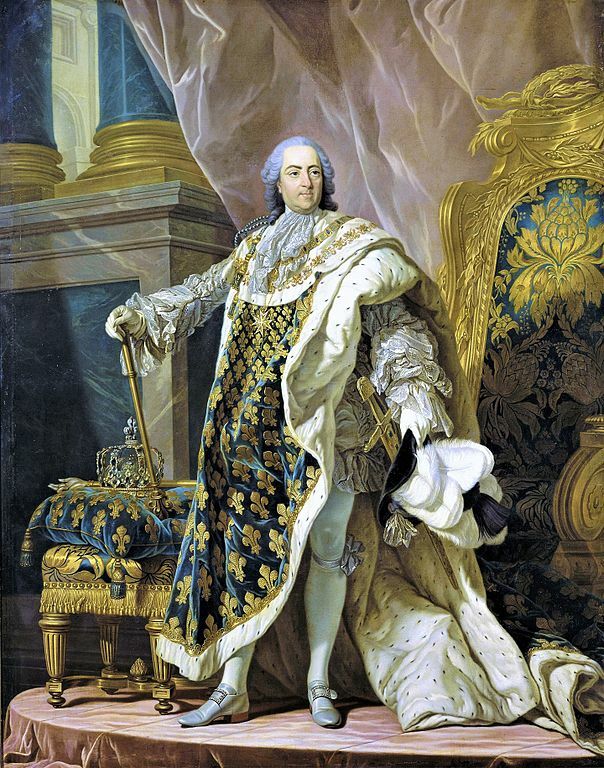 However, with dire consequences, Louis XV’s reign was marked by the same disastrous spending on maintaining France’s position in Europe as the reign of Louis XIV. With the resignation of Orléans, catastrophe was averted by the appointment of Cardinal André-Hercule de Fleury, who essentially served as the king’s first minister. Louis XV left most of the government of France to Cardinal Fleury. Fleury stabilized France’s currency, built roads, expanded the reach of the merchant marine, and stimulated the economy. He set his sights on peace, although the War of the Polish Succession was unavoidable because of Louis XV’s marriage to Marie Leszcynska, a member of Polish royalty. Although Cardinal Fleury attempted to make the kingdom more fiscally responsible, the dynastic wars of Europe continued to drain the French treasury, as they had during the reign of King Louis XIV. Indeed, during the reign of King Louis XV, two of the largest wars in French history, the War of the Austrian Succession and the Seven Years’ War, took place. These wars would be global conflicts, because not only were France and England combatants in Europe, but the fighting spread to overseas colonies. The War of the Austrian Succession highlighted the rise of Maurice de Saxe to French command; he had joined the French army in 1720. De Saxe was a son of King Augustus II of Poland. The era of Maurice de Saxe marked the apogee of the reign of King Louis XV. With the death of Cardinal Fleury during the war in 1743, Louis XV lost his most important minister. He sought to govern on his own but lacked the abilities to do so. Too much influence was given to his mistresses, Madame de Pompadour and Madame du Barry. At the same time, unchecked by the king, corruption worked to sap the strength and morale of the army. In 1756, in a move at least partly attributed to Madame de Pompadour’s influence, Louis XV embarked on what has become known as the diplomatic revolution of the 18th century. Orchestrated by Maria Theresa’s foreign minister von Kaunitz, the diplomatic revolution saw the alliance of France, the Holy Roman Empire (of which Austria-Hungary was the most important part), and Russia. With Frederick the Great of Prussia occupied with the Russians and Austrians, in the fall of 1757, Louis XV sent a French army under Marshal Soubise to attack Frederick from the rear. Unfortunately, Soubise, a product of the favoritism now governing France, proved no match for Frederick. Then on August 1, 1759, a French army commanded by the marquis de Contades suffered a serious defeat at the hands of a British, Hanoverian, and Prussian army led by Prince Ferdinand of Brunswick. Contades was only saved a near-rout like Soubise’s because Sir George Sackville, through cowardice or incompetence, refused to charge the enemy with his cavalry squadrons. While the war was going badly for Louis XV in Europe, it was worse overseas. British prime minister William Pitt had set as his goal the destruction of France’s colonies. The war began in 1754 with a skirmish in North America where George Washington made his first appearance in command against forces from New France (Canada). In North America, the conflict became known as the French and Indian wars. 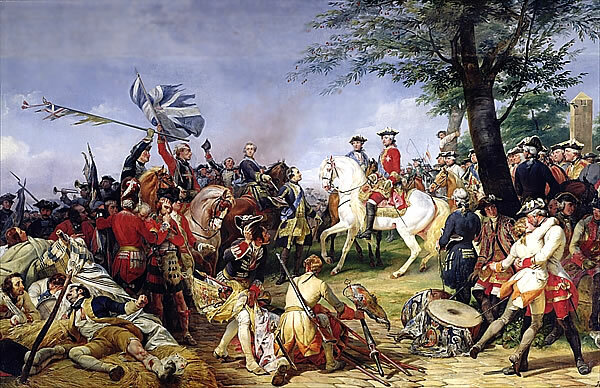 In 1760 the French finally surrendered to Jeffrey, Lord Amherst at Montreal. In India, the British East India Company, supported by regular British troops, fought its own struggle with the French Compangnie des Indes, buttressed by French troops sent from France to support it. Yet, in India too, the balance of power tipped in favor of the British. In February 1763, the Seven Years’ War was brought to an end for England and France by the Treaty of Paris, by which France relinquished its claims on New France. France, however, retained its islands in the French West Indies which, because of their great production of sugar, the French government valued more than New France. The end of the war found the reputation of French arms, raised to new heights by Maurice de Saxe, at its lowest point in the century. Financially, the years of war were a calamity for France. Efforts to reform the financial system of France proved frustrated by opposition, and Louis XV lacked the personal determination to force them through opposition. Although the last decade of Louis XV’s reign passed in relative peace, it was only the quiet before the storm. Only 15 years after his death, the French Revolution destroyed the monarchy.